On Saturday, July 15th, we opened our 3rd exhibition for the year, 'Kindred', a group show featuring 9 of the Gold Coast's top art educators. Even the poor weather didn't stop the 150+ people showing up and supporting art and culture on the Gold Coast. We had a fantastic evening, with the lovely Tracy Cooper-Lavery, Director of the Gold Coast City Gallery, opening the show, and some delicious food in the form of Siguenos, a Mexican food truck. Thanks to QT Mutual Bank for supporting the exhibition, and of course to the 9 artists for being part of this vibrant and diverse show. Special thanks goes to Larissa Warren for curating. A heartfelt thanks to everyone who came to the opening of Dual Elements. What a wonderful evening, filled with vibrant colour, lively discussions and plenty of laughter. If you weren't able to make the opening, call into the gallery to experience the vibrant exhibition for yourself. With over half the works sold and only 2 weeks left, we look forward to seeing you soon. Learn to paint and enjoy an exclusive exhibition experience with award winning artist, Tamara Armstrong. This 5 week painting course is aimed at beginners and will introduce participants to achievable tonal drawing and painting techniques to gradually work towards completing a boldly painted succulent garden on a 30cm diameter circular canvas. Once completed, your artwork will be professionally scanned, printed and framed, ready for you and your VIP guests to appreciate at your private viewing, in our stunning gallery space. On the final workshop evening, participants will learn the dos and dont's of professionally hanging their artwork, before hosting a VIP preview evening, including complementary bubbles and nibbles, for their friends and family. All art materials (including quality acrylic paints) will be supplied and participants will also receive a free pack of artist grade pens and paint brushes to help keep them painting after the workshop! Salt Bar and Restaurant at the Ferry Road Markets was recently renovated and the new owner wanted to fill a large wall next to the bar with a custom wall mural of an Italian alleyway. We found this image on Shutterstock, which worked fantastically as the perspective allowed the viewer to be fooled into thinking they were about to walk down a lovely little alley in a quaint Italian village. At Left Bank Gallery, using our HP Latex printer, we print onto a PVC-free wallpaper product that doesn't require any pre-pasting of the surface it is being installed onto, you simply wet the back of the paper and that activates the adhesive. And because it is a digital printer, it means we can custom make the wall murals to any size, rather than having to print off kilometres of the same design like traditional wallpaper printing. So now for under $800 you could fill a standard 3 metre wide by 2.4m high wall with an image of your choice! This aerial image of Broadbeach Waters and its surrounds, was purchased from Skye Pics Aerial Photography and digitally printed on our PVC-free Wallpaper, before being installed by Space Painters onto the wall behind this lovely reception area at a real estate office in Broadbeach Waters. This completely custom wall mural is just one idea of many that our customers use to transform their walls. With digital printing technology, it is now possible to create custom wall murals from just about any image, and as it is custom made for you, there is no wastage like traditional wallpaper. We split the image into panels to suit the exact size of the wall it is going onto. We recently printed this shutterstock image of Surfers Paradise beach and had our pals Space Painters install it on a boardroom wall in a real estate office at Broadbeach Waters. We can print any (decent quality) image onto our PVC-free wallpaper product, which just requires a spray of water to activate the adhesive - no need for the mess involved with pre-pasting walls like traditional wallpaper. We can arrange to have it installed by our professionals or, if you consider yourself a bit of a DIY'er, you can definitely install it yourself. Check out stock image sites like Shutterstock, iStockPhoto, Unsplash - or provide us with your own digital images, or we can scan in your hard copies of original photos, drawings, letters, just to name a few! We were given the opportunity to provide a massive 7 metre wide by 5 metre high custom wall mural at the new Chinderah Service Centre. This stunning image of the Byron Bay lighthouse was sourced from Shutterstock for its perspective, that allowed patrons to view the wall as if they were at the base of the path up to the lighthouse. As per usual, this wallpaper was installed by the experts at Space Painters, who braved the heights on a scissor lift. What a great night we had officially opening our gallery space with the fantastic work of three local photographers - Amanda Tzannes, Laura Goodall and Matt Shepherd. We packed the gallery out with around 200 people which was great to see. Stay tuned for more exhibitions in 2017! Local Artist Spotlight: Tamara Armstrong. Tamara Armstrong - aka My Friend Can Paint - is a full-time practicing artist based in the beautiful surrounds of Tamborine Mountain in the Gold Coast Hinterland. Tamara works from her purpose-built home studio to create artwork & designs that are colourful, bold & energetic. Painting is her passion & her work is largely inspired by graphic design, retro collectibles, fashion & delectable colour combinations. Tamara & Left Bank Gallery are collaborating to bring you fine art reproductions from original works to brighten and liven up your walls. Available as a framed print or stretched canvas in a variety of sizes and frames to suit your space. 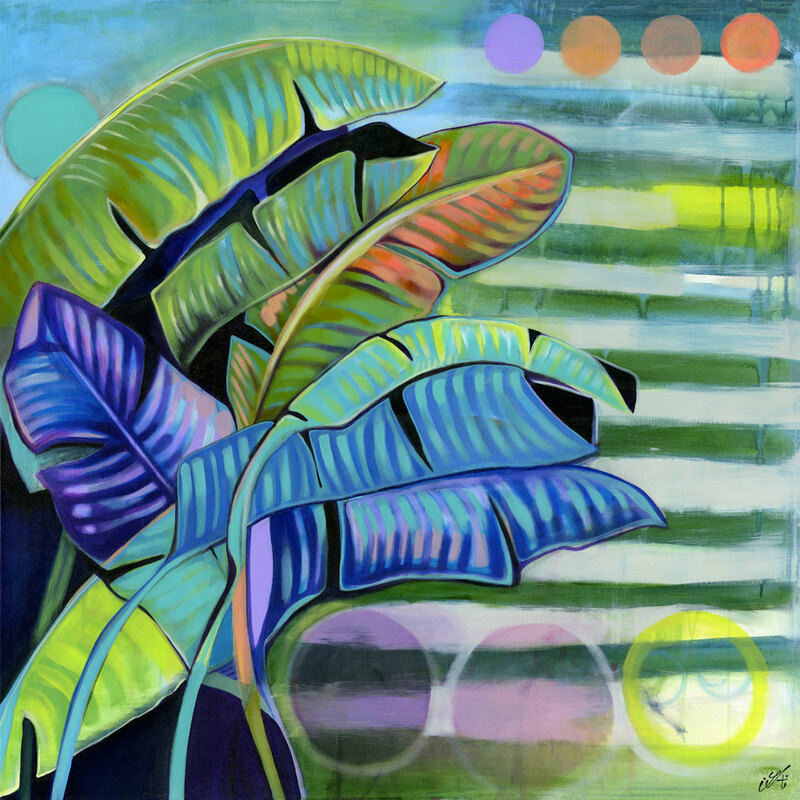 Tamara Armstrong’s paintings and mural works are recognisable in various galleries, public spaces, fashion boutiques and cafes across Queensland. Come and visit us at our Southport showroom to view our special collection of Tamara's works and become inspired! Watch out later this month for the launch of our online shop, featuring our art catalogue and a selection of other talented local artists. Read more about Tamara & her partnership with Left Bank Gallery in More Gold Coast's recent article. THE BORROWED GARDEN, TAMARA ARMSTRONG. FRAMED IN RAW OAK & AVAILABLE FROM OUR ONLINE SHOP. Corporate Office Wallpaper in Surfers Paradise. One of the first wallpapers we did last year was printing a lovely, simple logo pattern for an office space in Bundall on the Gold Coast. We were approached by the business owner to create 2 walls for them utilising their logo mark in a brick pattern, all in grey except for one of them, in the company’s other colour, a bright and deep red. 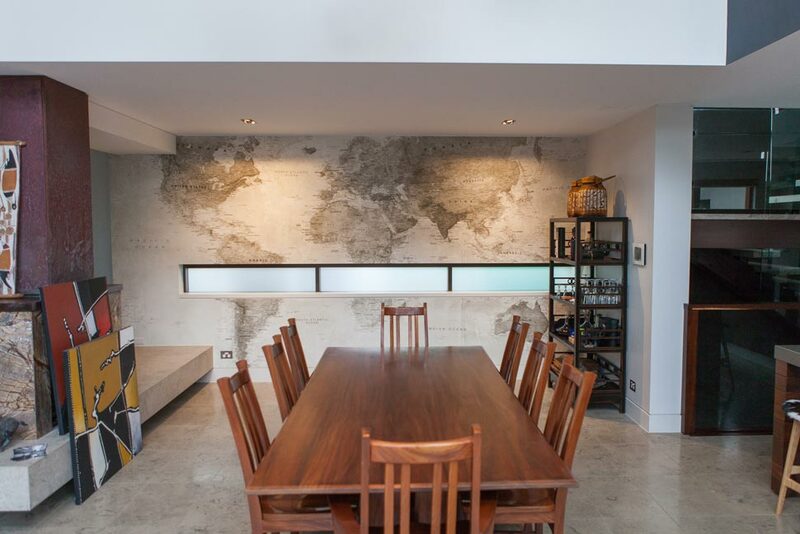 Installed into their main work area, the wallpaper creates a subtle interest to what would been otherwise been just another plain coloured wall. Not only does it spruce up the office space but it also reinforces the brand to customers when they are visiting - which is a fantastic professional look. Wallpapers are an awesome way to add some interest to a corporate space. here at Left Bank Gallery we have done a few spaces now and interest continues to grow. From simple graphics like the company logo, right through to custom designed illustrations or even stock photos, the possibilities are endless. Motivational quotes are a popular choice, especially for sales and marketing offices. Photos of a project or development with the branding are also continually popular. All About Print: Part 3 (File Formats). Adobe’s Creative Cloud (CC) is a suite of creative applications that includes print design programs Photoshop, Illustrator and InDesign. CC is the industry standard design software and as such is accepted at all print suppliers. Programs such as Microsoft Word, Powerpoint and Publisher are not supported and should generally be avoided when creating graphics for print production. Photoshop, Illustrator and InDesign are the three main programs used in the print design world, and they have a variety of file formats available to export out from their native file type. The native file type is what the ‘default’ file of the application is, or basically, what the application works with whilst creating and working on the file. This can be saved for future use, and can also be saved or exported as a different file format for publication or sharing. For Photoshop, the native file format is a PSD, for Illustrator it is an AI and for InDesign it is an INDD. These three programs have very different duties - Photoshop is used for image editing and compositing of ‘raster’ aka ‘bitmap’ images like photos, whereas Illustrator is used for, you guessed it, illustrations and ‘vector’ graphics like logos. InDesign is a page layout application, similar to Microsoft Word but a much more comprehensive, professional design based piece of software. InDesign brings together your files from Photoshop and Illustrator and allows you to lay them out on a page, and also allows you to style the text. For example, say you were designing a brochure for a winery. You would create the layout in InDesign, but you would open the pictures of the winery in Photoshop first to do things like colour correction, remove anything unnecessary etc. You would then ‘place’ the images into the layout in InDesign. The logo for the winery would be a vector file so it could be created in Illustrator and then placed into InDesign. You would complete the layout in InDesign and save a native file along with exporting a PDF for printing. In the past, you would use the native PSD (Photoshop Document) format for working on files inside of Photoshop. A copy of this working file would then be saved as a TIFF for placement into a page layout program like InDesign (back in the day there was other programs called PageMaker and QuarkXPress). Nowadays, a native PSD can be placed into InDesign with no problems. However, my personal workflow is keeping a layered, RGB Photoshop file as the native ‘working’ file, and then flattening this and converting to CMYK to save as a TIFF for use in InDesign. I don’t flatten the TIFF file if transparency is being used. When saving a TIFF, you can choose whether to flatten the layers or leave them - on the Save dialog box there is a checkbox for ‘Layers’ that I generally leave off. Once you press Save, a secondary dialog box pops up with the TIFF options on what compression and byte order you’d like. Always choose None for Image Compression, otherwise your TIFF becomes a ‘lossy’ file and will degrade in quality with each save. Byte Order should be what format the file will be used in, but most programs open files from either format. Image Pyramid can be left unchecked as not many programs support this. Save Transparency can be checked when saving a transparent file. And finally, I usually select Discard Layers and Save a Copy so that I am getting a TIFF with only 1 layer and therefore its optimum file size. If you’re saving the image for on-screen use and this particular file will not be printed, it is best to leave the image in RGB colour and save as a JPG. This is great for proofs of designs, and sharing/emailing photos quickly and easily. In Photoshop you simply choose File > Save for Web and you are presented with a dialog box where you can select your file type and compression options. Most of the time your file type will be JPG and you will need to work out the balance between file size and image quality, as obviously, the lower the file size, the less in quality the image will be. Sometimes, it is feasible to save a GIF, for simple graphics with low tonal ranges, like logos, that generally are ‘flat’ colour. Illustrator is a lot easier than Photoshop to manage files from. Basically, there are two types of files from Illustrator - the native AI format, and the EPS format, although the EPS format is quickly becoming redundant as Adobe CC becomes the norm across all creative industries. It used to be that you would design your vector work in Illustrator and have your native AI file, and then save an EPS for exporting to supplier, for example, a sign writer, as in the past they would use Corel Draw. Now that more people are using CC, sending an AI is just as accepted. PDFs can also be saved out of Illustrator and personally I find this works well for saving a logo, for instance, which isn’t going to be placed into a layout in InDesign (where it would be saved as a PDF). This is even more simple than Illustrator - in InDesign, you only have the INDD native file format. Once you want to get your document printed, whatever it may be, from a simple 1 page flyer, a 2 page/sided business card, or a 12 page booklet, you export the file out as a PDF, and that’s it! Inside of InDesign, by choosing File > Export you are given the option to create a PDF that is Interactive (for use on screen with buttons etc) or for Print (for print use). We usually leave the Print option as our default and only change to interactive if we are indeed, making an interactive PDF document that requires buttons and videos embedded in it for example. The rest of the time, we will use the Print PDF setting. Once you choose this and decide whereabouts the file is to be saved, press Save and you will be presented with a new dialog box for Exporting Adobe PDF. Here, we use only two of the presets: Smallest File Size (for proofing) and Press Quality (for printing). It is important to remember to check Use Document Bleed Settings under ‘Marks and Bleeds’ when creating a Press Quality file for printing - our tip would be to save yourself a preset with this checked! We’ll cover files a bit more in the coming weeks when we discuss Image Resolution and raster versus vector images. Mercedes Benz Sanctuary Cove Wallpaper. In one of the more prominent wallpapers we’ve done, we actually had a tight deadline to meet with this job. We were asked by one of our interior decorators to print imagery supplied by Mercedes Benz head office for the new mini-showroom that was opening in Sanctuary Cove’s Marine Village. Once the approved images finally came through, we had to print and install inside a few days to ensure there was enough time left to bring in the cars and have an opening party! Some beautiful imagery was supplied to us by the marketing department at Mercedes Benz and once we were able to get approval through for the particular image on the particular wall, we rushed the print through and had our installers on site next day to get it stuck up on the wall. The main image of a AMG and a motorbike are almost life-size and really pop in the showroom. We also supplied vinyl stickers for the back window that was tricky to work around with the aluminium frames and the images we had to choose from. We ended up using the stunning image of the silver CLA with the multi-colour light reflections on the outside window and then a similar shot of the AMG for the inside window that can only be seen slightly from the showroom - hence the reason it has been cut off. All About Print: Part 2 (Colour). As the technology around printing continues to push boundaries, colour becomes more economical to print, thus allowing it to be a very permanent fixture in all visual communication from newspapers and magazines to large format wallpapers and billboards. With the advent of low-cost full colour printing and developments like six-colour hexachromatic printing, colour is affordable and it is everywhere. This is why it helps to have a basic understanding of colour, especially if you are a professional designer or even a hobbyist, as colour is one of the most important tools in graphic design. Not only are there an almost infinite number of variations available at our disposal, but there are countless ways of combining them across many different types of media. You’ll hear a lot of different terms thrown around when talking about colour. Here, we’ll investigate some of the more useful ones. To break it right down, there are basically three different ways to describe colour: Hue, Saturation, Brightness. Hue refers to a unique colour’s name that helps us visually distinguish between one colour and another. Basically, it is the generic name of the colour - for example, red, blue, yellow. Saturation essentially means how pure or how grey a colour is. Not to be confused with how light or dark it is (see Brightness below). Saturation describes if the colour is high intensity - pure and bright, or low intensity - dull and grey. A single hue (colour) will have a huge amount of variations ranging from light ‘tints’ to dark ‘shades’. The more white that is in a colour, the lighter it becomes, and it is known as a tint. On the other hand, a colour with more black in it becomes darker and known and a shade. Hue, Saturation and Brightness can be manipulated easily using image editing software and designers can now easily change the entire appearance of an image in a matter of minutes. The colour wheel shows primary, secondary and tertiary colours, and a full wheel will also show tints and shades of these colours (as above). Primary colours are red, yellow and blue - this is not to be confused with colour ‘models’ used to display colour on screen or in print (more detail on this below). Secondary colours are produced by mixing any two primaries together, resulting in orange, green and violet. The six tertiary colours are made by mixing a primary colour with the secondary colour closest to it on the wheel, producing red-orange, yellow-orange, yellow-green, blue-green, blue-violet, and red-violet. So we now have access to 12 fairly basic colours, and once we add their tints and shades to them (as in the image above), the choices start becoming endless! In order to have a good understanding on how colour works, it is essential to know that coloured light and coloured pigment do not operate the same. Coloured lights, or ‘additive’ colours, are represented by the RGB system. Coloured pigments, also know as ‘subtractive’ colours, are represented by the CMYK system. Put simply, when viewing an image on a screen, which is made up of coloured lights, it may not appear the same as when it is printed, using the CMYK system. RGB stands for Red, Green and Blue and it is an additive colour model where red, green and blue light are added together in various ways to reproduce a broad range of colours. When all three colours are added together, the result is white light. As mentioned above, the RGB colour model is used to represent images on screens such as televisions, computer monitors and displays on devices such as smart phones and tablets. Cameras and scanners capture images in RGB. RGB is what is known as a ‘device-dependent’ colour model. This means that different displays will reproduce a given RGB value differently - so what RGB colour I see on my computer monitor can differ to the colour you see on your computer monitor, and again on your smartphone. It is important to remember this when designing and also when sending and viewing design proofs. The range of colours produced by a colour model is known as it’s ‘gamut’. The RGB colour gamut can reproduce around 70 percent of the colours visible to the human eye. The CMYK colour model can’t reproduce as much as RGB so when designing be aware of this limitation. It is a common mistake of designers (both hobbyists and professionals alike) to submit artwork for printing in RGB. The results upon completion can be slightly underwhelming! RGB is able to reproduce brighter, more saturated colours simply because it is based on light. Your monitor is not a piece of paper! RGB is used for anything that will be displayed on-screen for example; websites, apps and web advertisements. CMYK stands for Cyan, Magenta, Yellow and Black and it is a subtractive colour model used for colour printing. Inks in the CMYK model ‘subtract’ brightness from the white or brightness of the paper, reducing the amount of light being reflected. CMYK is the opposite of RGB where white is the natural colour of the paper and mixing the coloured inks together results in black. The ‘K’ in CMYK stands for ‘Key’ - when printing, the three colours Cyan, Magenta and Yellow align with the Black, making it the ‘key’. Another way of explaining it, although not correct, is that because ‘B’ is already being used by Blue in RGB, ‘K’ is used as it is the last letter in Black. The important thing to remember is that the CMYK colour model is also ‘device-dependent’, so colours can vary from printer to printer. As is the case with RGB, CMYK only reproduces a subset of the spectrum visible to the human eye. As mentioned in RGB above, the gamut of CMYK is less than that of RGB, making it a difficult proposition to design a printed piece, as you are viewing it on an RGB screen. In colour printing, the four colours of CMYK mix together to create millions of colours. This process is often referred to as ‘full colour printing’ and can also be known as ‘four colour printing’. We will cover CMYK and printing in more depth when we discuss the different printing processes in the coming weeks. 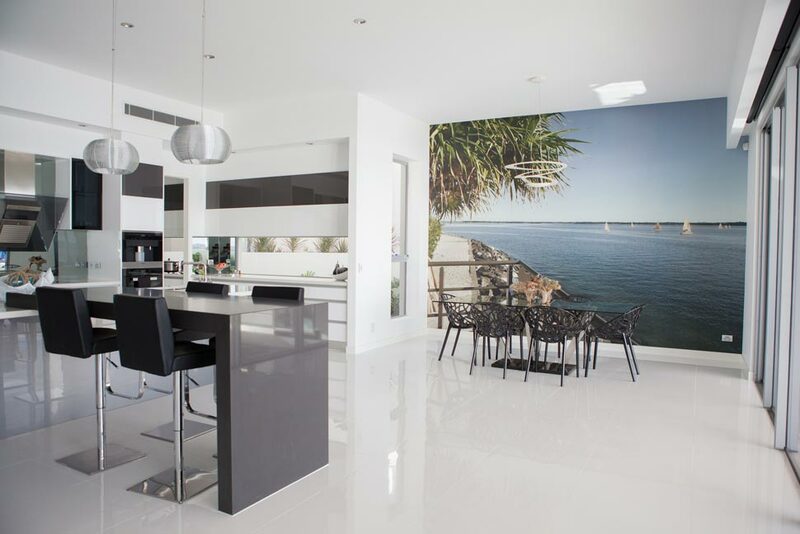 This custom wallpaper was installed into the beautiful dining area of this new home on the Broadwater of the Gold Coast late in 2014. After the owners had some pictures framed with us whilst building their new home, they saw our wallpapers on display in our showroom. The owners then presented us with 2 photographs they’d taken from very close to their block and asked if we could do something with them. They wanted to have the big pandanus tree included, and with the walkway along the waters edge too to try and get the effect of it being the real deal. However, they also wanted to see some sailboats in the Broadwater and also have the colours muted so they wouldn’t stand out so much. We took the two images into Photoshop and grabbed the sailboats and copied them into the water on the pandanus image. With a bit of Photoshop trickery, we were able to make them appear as if they were in the photo originally. Then with a few simple colour changes we were able to make the desaturated/muted effect the owners were after too. What we also did was flip the image so that the pandanus was on the left rather than the right - this allowed it to appear as if it were coming from the outside garden, and the water on the right 'split' into the actual Broadwater outside. After the image was approved by the client we sliced it up into panels and printed it out on our huge HP latex printer, on HP’s own PVC-free wallpaper. This product has no harmful solvents and therefore does not require outgassing nor does it have a unpleasant smell to it. Within a few days it was installed into the dining room and as luck would have it the horizon line of the wallpaper met up with the actual horizon outside, so it made for a very realistic effect. Last June, we scanned in this beautiful original piece of canvas artwork by local artist John Maitland. We have been doing picture framing for John for years now, but after he was commissioned by a Brisbane-based Catholic school to not only create this piece but also provide prints, he asked us what we could do. Originally, we had thought to photograph it - being 1300mm wide and 1800mm high, it would make for a very difficult scanning process. However, without a very expensive setup and a professional camera for art reproduction, standard digital SLR photos produce sub-par results that require a lot of colour correction. This method doesn't capture the fine details and textures that you get from an original piece of art. So we opted to scan it in on our professional Epson V700 scanner, which is only A4 (210 x 297mm). At first glance, you could be forgiven for thinking that it would only require approximately 36 to 49 scans (6 x 6 or 7 x 7 A4 sized scans to capture 1300 x 1800mm). However, when scanning large pieces like this, you need a healthy amount of 'overlap' so that you can join each individual scan easily. So instead of around 7 scans at 210mm wide to a 1300mm wide row, we captured around 12 or 13 each time, and instead of 7 scans at 297mm high to the 1800mm height, we played it safe and scanned 13 rows. This resulted in approximately 150 individual A4 scans and around 4 hours work! Above you can see each of the 13 rows before they were merged together into the final piece that you see at the top of this article. So each one of the 13 rows above are actually made up of around 12 A4 scans. This is the process required to capture the detail and allow for an accurate final file. We would scan a single row of 12 in, and then merge it together before starting the next row, to ensure nothing had been missed. Once that was confirmed, we would move onto the next row, allowing around 100mm of overlap. This overlap can be seen on the strips above - note the subjects eyes are in the first and second rows on the left, and even slightly on the third row. The image above shows the texture that scanning allows us to capture. You just wouldn't get this kind of detail from a standard photograph. This level of texture across the entire piece allows for an incredibly detailed print, and the colours are captured perfectly too (look at the gold in the image above!). We printed a limited edition run of these prints at 500 x 700mm on our Epson fine art printer on a beautiful, heavyweight, textured cotton rag paper. John signed and numbered each individual print. This stunning wallpaper of a pair of cat eyes was installed into Bar Chico on Tedder Avenue in Main Beach. Our designers carefully matched the turquoise colour to the tiles using a piece of tile off cut and a few trial and error small prints. The image is a stock photo that originally had the eyes as a golden colour, however the client required the colour to match the fit out, so we took the image into Photoshop and altered the colour to suit. The challenge presenting itself to us with this wall was that it was going to be the end of the bar, so there was the very likely chance that there would be spills, putting a paper based wallpaper at risk. We opted to print this on self-adhesive vinyl instead, as the plastic nature of the vinyl means it is waterproof. We also added a laminate to the print to gain an extra layer of protection. We printed the artwork across two panels and installed it to the wall prior to the bar being installed. The wallpaper sits on the back wall facing the front door so it is one of the first things you see when you walk in. Be sure to check out Bar Chico next time you’re in Main Beach! All About Print: Part 1. All about print is a series of educational articles focused on the world of ink and paper, something we’re hugely passionate about here at Left Bank Gallery. Every fortnight, we present a new topic full of helpful information with the aim of helping our clients better understand the vast industry that is printing. To start the series off, we’ll begin with an overview of the topics we will cover in the coming weeks. Colour is by far the most difficult aspect of printing. Not only do different devices, like scanners and cameras, capture colours differently, but every screen/monitor will display colour differently. Monitors will display colour differently depending on the ambient light, so the type of light in the room, and the way it reflects off the walls, can influence what colour is shown. And if that’s not enough, every printer will interpret colour slightly (and sometimes significantly) different to the next. Let’s not forget that colour is perceptual too! The lovely lime green I see may look more dull and olive like to you. Another consideration when talking about colour in printing, is the colour ‘mode’. You may have heard the terms ‘RGB’ and ‘CMYK’ thrown around before. These are colour modes - RGB stands for Red, Green and Blue - the colours that are used to display digital images on screens including your television, your computer monitor, and your phone. RGB is not used for printing. The RGB and CMYK colour modes. Notice how when two colours overlap, it creates a colour from the opposite mode i.e. Blue and Red in RGB overlap to make Magenta - however it is a vivid magenta, whereas the CMYK Magenta is less vibrant. 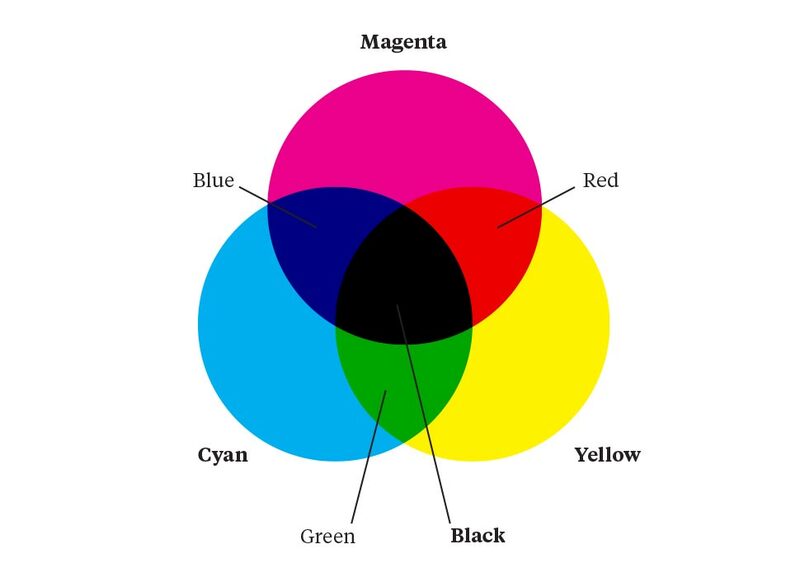 CMYK stands for Cyan, Magenta, Yellow and Black (K so as to not be confused with Blue, or because it is the ‘Key’ colour). CMYK is the colour mode used for most printing we see today. The four colours mix together to create millions of printed colours. We’ll cover the nuances of colour management and colour modes in more depth when we dedicate a whole topic to it in a few weeks time. With the proliferation of the internet and personal computers in the past decade and a bit, almost everyone has access to tools to create designs or artwork. However, most consumer program suites don’t create the correct file types necessary for high quality reproduction on a printing press. PDF files are great for printing. The most common filetype in today’s digital world would have to be the JPEG (Jay-Peg) or JPG. This file format is used primarily for photos as it has a great knack of compressing the files size so it is easily downloaded and viewed. The fact that it is a compressed file makes it not ideal for printing. Another common format is the PDF. This generally is the preferred format for printing in, as the PDF, when saved correctly, does not compress files like a JPG does. TIFF files are another format great for printing, as they are a ‘lossless’ file type that allows for high quality files to be saved time and time again, without any compression. These are superior to JPGs, but they are generally large files so are quite often hard to send and download. Vector files are created in professional design programs, and they are a completely lossless file type that can be scaled to any size without loss of quality. For example, vectors are ideal for logos so they can be scaled up and down with ease. Vector files are quite often saved from Adobe Illustrator in the native AI format, but can also be saved as EPS files too. Bitmap and GIF files are low quality files used on the internet and are therefore not suitable to print from. There will be a more in depth breakdown of file types in a few weeks time. When talking about a ‘raster’ image - which is an image made up of pixels (any photo you take on a camera, or image captured by a scanner) - the main concern is the resolution of the image. Resolution is measured by how many pixels per inch (PPI) the image contains. You may have heard the terms 72dpi or 300dpi before. DPI actually stands for dots per inch and is meant to describe the number of dots a printer is capable of putting down onto the paper, not how many pixels are in an image. However, it has become the common way of describing resolution instead of PPI. We’ll stick with the correct terminology! An example of how pixels per inch work and how it effects how an image displays. 72ppi images are suitable for on-screen display, as they are generally lower quality because they contain fewer pixels. However, a lot of digital cameras capture images at 72ppi, even when they are set to their highest quality. This is because the actual file itself is about 1000 x 700mm in size, so it is a huge physical image, but doesn’t have many pixels per inch at this size. A simple conversion in Photoshop to 300ppi makes the image 240mm x 168mm. This is the true, high resolution ‘printable’ size of the image. We’ll divulge more information on Image Resolution in the coming weeks. There are many different ways of getting ink on paper, and we humans have been doing it for thousands of years. Without getting too much into the history of printing, and every printing method available, there really are a two mainstream methods used today. A cross-section type look at how an offset press works. Offset printing, also known as Offset Lithography or Litho Printing, is the most common way to print items such as business cards, letterheads, newsletters, postcards and flyers. It is cost effective on medium and long runs and is a high quality, versatile method of printing. The concept behind offset printing is that oil and water don’t mix, so the image area of a printing ‘plate’ attracts the oil in the ink, whilst the non-image area is wet, and repels the oil-based inks. This plate is then pressed onto the surface of the substrate. Digital printing has emerged in the last 20 or so years as the newer, more popular way to print. Digital printing is produced on either a inkjet or laser printer, where the image to be printed is sent directly to the printer via a digital file (like a PDF). This eliminates the need for a plate, so the cost savings are huge for smaller runs. Digital printing can be expensive once larger runs are needed, as the costs are fairly fixed, unlike offset printing which has large setup costs, but minimal costs once it is underway. Other methods of printing like Screen Printing, Flexography, Pad Printing, Letterpress Printing and more will be discussed in a few weeks time. In conclusion to today’s post, we’ve just scratched the surface on a few of the major topics to do with printing. Over the next couple of months, we’ll release a dedicated post on each of the points covered today, with more detailed information. The design and print team at Left Bank Gallery - myself (Toby), Michelle and Julia, are well experienced in all things print. I’ve worked as a print designer for 12 years now, and have been running small and large format printing machines here in our Southport workshop for around 6 years. Contact us today to discuss how to setup your files for printing or for any general design and print advice. World Map Wallpaper at Mermaid Beach. We printed and installed this amazing vintage world map wallpaper late in 2014 at a beautiful beach house on Hedges Avenue at Mermaid Beach on the Gold Coast. Our designers created the vintage look with a hint of sepia tones, to match the clients interior colour scheme, inside of Photoshop where we added rough textures also to give the entire wallpaper a worn feel. The wall posed a small challenge with the long, thin window sitting in the bottom half. Rather than lose big chunks of the world map, we split the map into 2 sections, and with a bit of Photoshop magic in the Pacific Ocean we were able to make the entire image work within the space presented to us. At Left Bank Gallery, we love challenging ourselves and solving all sorts of problems - this is another example of how our custom wallpaper solution can be used in almost any situation. The world map itself has an incredible amount of detail. Every city in the world is listed, so it makes for a fantastic interactive piece, where you can use colour coded pins to mark the cities you’ve visited, adding another layer of dimension and interest to what would be just another plain wall. Not only that, but with the expertise of our design team, we can completely custom print the world map wallpaper to any colour and size you would require. SO you're not limited to vintage style graphics, you can have bright colours, black and white, muted pastels... the list goes on. Our high resolution map is ready to customise today, so get in touch with us to discuss how it could be used on your next project. Fine Art Giclée Printing With The Epson 9900. We've been running our Epson Stylus Pro 9900 large format printer since early 2009 from our print room in Southport on the Gold Coast. Toby and the print team at Left Bank Gallery have years of experience in printing and can offer exceptional knowledge and practicality when it comes to producing fine art 'giclée' prints from the Epson 9900. The Epson Stylus Pro 9900 represents the highest level of innovation and performance for fine art and commercial print applications. Designed for 44" wide printing, Left Bank Gallery can produce large scale prints of the highest quality. Epson's latest High Dynamic Range pigment inks offer exceptional quality for true archival printing - colour images are rated up to 200 years whilst black & white printing lasts even longer! Eleven individual ink cartridges offer a super wide color gamut that no other printer can achieve. We print on a range of standard matte, satin and gloss photo paper, along with 100% cotton canvas and a fantastic silver pearlescent/metallic photo gloss paper. For true fine art reproductions, we have 2 cotton rag papers available for an undeniably exquisite finish. At Left Bank Gallery we can also scan your original artwork at high resolution, and of course we can frame your printed artwork once it comes off the machine - so the quality control is second to none when everything is completed under the one roof. The image above is a print for one of our talented clients, Matt Shepherd Photography.